In June we held our annual general meeting, where around 50 local residents and partners held us to account. That same week over 120 colleagues, mostly clinicians, attended our annual leadership conference (where we try and make our own weather and sort out the future). My monthly blog is about keeping you in touch with what we are up to, but also trying to join up the dots of what we say and do, and sometimes connect that to national announcements or issues. This month I want to focus on our future, but before I do I need to be very explicit about the present. Right now inside our Trust we are battling to make sure hand-washing happens. 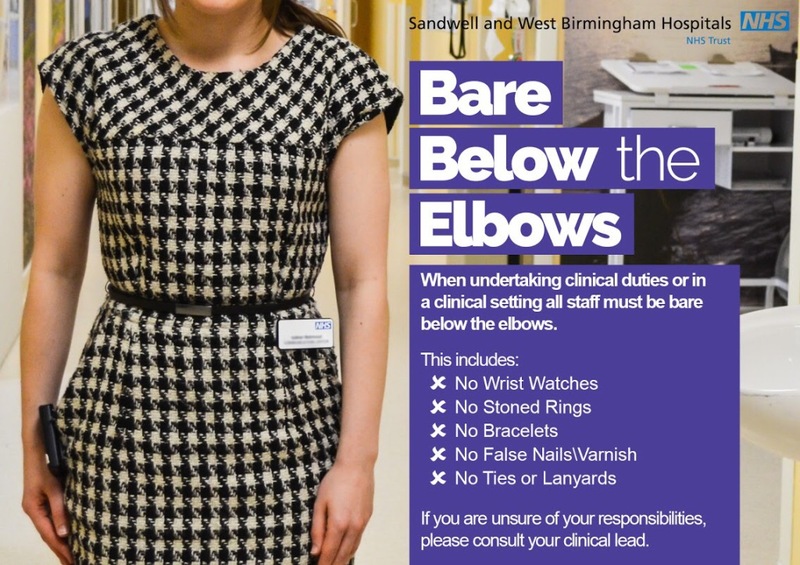 That is why our latest bare below elbows images adorn this blog. 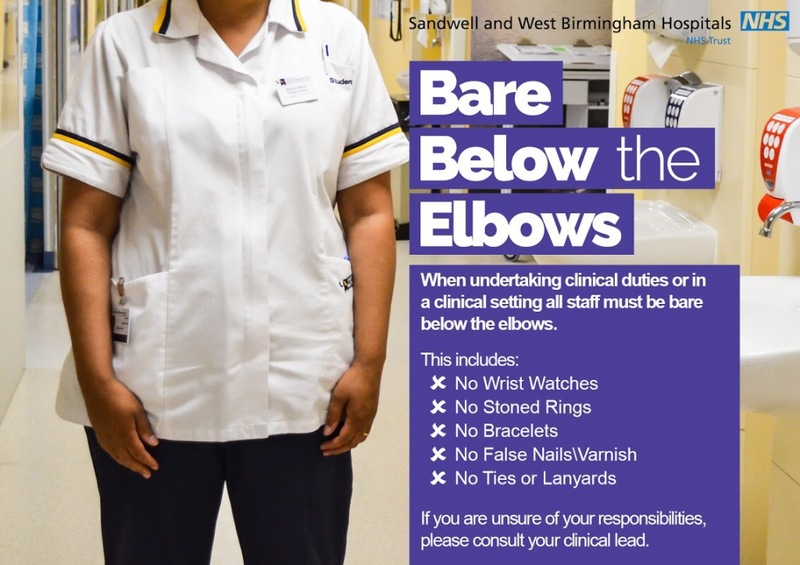 Over the last three months we have pretty successfully worked through our OK To Ask campaign, encouraging, celebrating and permitting people to talk to each other about whether their hands are clean, on entry to the home or ward, and between patients, and both hands. I am endlessly amazed by folk who ‘do’ one hand as a gesture of compliance. It is only funny-peculiar for a moment. These things are going to change here. It may take more compulsion, sadly, in the weeks ahead. At the same time we are finishing our final workforce consultation of the year, which completes the journey to safely reduce our budgeted staffing by 400 posts when compared to this time last year. This is, even in an organisation of 7000 people and 150 locations of care, a massive change. In the next four years a further 1000 posts will change. I am genuinely proud, as an NHS “lifer” and passionate supporter, of our candour with staff, and the successful redeployment and support model we have in place. Proud too of the huge change in training and development funding we have brought in since 2013 but always conscious too of the impact for individuals, their colleagues, family and friends of what we are doing, of what I am accountable for, and therefore do. We absolutely can, and have, kept our promises about local employment and about re-training. Our Board and clinical leadership executive know why we have to change. Yet the process of change can be unsettling, prone with error and risk, and no colleague who raises concerns should ever be diminished for it. In my experience, often those concerns are mistaken, but we should always – every time – assume they are well founded and chase them through to tackle the underlying issue. To coin a phrase we never play the man, always the ball. And simultaneously, our 400 days without a Never Event has come to a shuddering end. Three Never Events in 100 days is unacceptable. All three patients are unharmed by our errors. All three errors are unconnected, and by the way in areas unaffected by workforce change but this is not our organisation at its best. What is our Trust at its best is the complete determination of those involved to never have that incident happen again. What we have to make sure is that the learning is spread. Over 1500 people attend our monthly quality improvement half days. That is an opportunity, but, as hand-washing makes clear, the chance to talk and learn, the encouragement to constructively challenge, can sometimes only take us so far. By being so outstandingly open about our Never Events I really hope we build trust and local confidence. A safe place tells you about its best and worst bits. That is what we do, and what did at the AGM in Sandwell, when five years of work across our staff, general practice, commissioners and others came together in the huge change in outcomes, satisfaction and quality seen in our maternity units since 2010. That future? Of course it is grounded in sorting out these issues. But our 2020 Vision, launched at the leadership conference after a year of work, and now out to public engagement for two months, tries to show what it could be like. Really it tells three stories. First that change will happen if we see through three transformational levers – changing our workforce, our skills, confidence and competence – bringing in great IT, to make sure we can work across sites and locations – and sorting out our locations so they support great care, both closer to home in places like Rowley, and in specialist expert locations, like our cardiac labs now at City, or Midland Met in October 2018. Secondly, that we have to make a reality of community based care right now. By placing your trust in our diabetes team, or our family nurse partnership, or our care homes team, we need to begin to address the dependence of our healthcare system locally on hospital care. For so many people who need us from time to time, it is a comfort that the hospitals are big and local. We need to make heroes of the services you cannot see in bricks or mortar, but those that keep people safe and well at home. That is what our integrated care pioneers ambition for 2016 is all about. 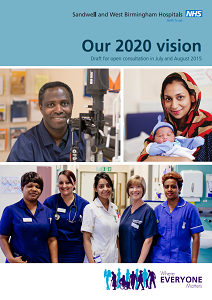 20 services which embody our vision for 2020 – putting in place now the care models we will be relying upon. As I put it in our AGM: My Mum would be involved in the rehabilitation of my Dad when he damaged his knees and was incapacitated for three months in hospital. She would know what she was letting herself in for when he came home, wheelchair bound. He would have had the chance to talk about what he wanted to achieve after his operations. Meanwhile, your relative, newly diagnosed with dementia, would benefit from the advice of a team able to help you think through what this means, with more sophistication than either moving into a home, or being left at home to cope. Negotiating outcomes; involving carers; coordinating care. At our best we do that now. As an NHS we can do that much, much more. In our organisation, as part of our system, we want this to be the new normal by 2020 – at the latest.